Who Wants to be the Queen of the Cricket Darting Hill? All dart players of all skill levels are welcome, however anyone under the age of 19 must contact us to in advance for permission. Should permission be obtained, they must be accompanied by an adult for the duration of a given event. For liability reasons, children younger than 13 are not permitted on the premises during the event. Tickets are $25.00 per player, with $5.00 going to orgaizing costs and $20.00 being added to the prize pool. The total amount available as prizes works out to $20.00 X the amount of paid players. American Cricket, as defined by the American Darts Association (ADA). Round-robin (groups of 5). All players must register with the organisers no later than 11:30 am. Failure to register by this time will result in your spot being given away to people on the waiting list and no refunds will be offered. Aim to arrive at the venue early. All people on the waiting list must register with the organisers no later than 11:30 am. If you have not signed in by that time, your name will be removed and the next person on the list will be given a spot in the tournament if one becomes available. To start a match, players will flip a coin to decide who will throw first for the bull. For subsequent legs, players can flip another coin or decide on their own who will bull first. A dart in the double-bullseye can be removed at the opponent's request. A dart in a single-bullseye must remain in the dartboard. If Player 1 throws a single bull and Player 2 also throws a single bull, Player 2 remains at the line and throws the next dart. Winner of the bull can decide who begins the leg. All legs will consist of Cricket as defined by the American Dart Organization. Each round-robin (group) match will be best of 3 legs (two out of three). There will be no more than 4 players per group and each player will play a minimum of 6 legs and a maximum of 9 legs in the round-robin portion of the tournament. Each leg won counts as 1 point. The top two players from each group will advance. Ties within groups will be decided by "Head-to-Head (take-back)" results between the tied players. Ties of more than 2 players within groups will be decided by one game of 701. Ties across groups will not matter (so make each leg in your respective group count). Important: The organisers are reserving the option to stop a group at 4:00 pm if that group's play is not already complete. If this happens, a player's win total will stand and the top two players will advance. The objective shall be to 'own' / 'close' certain numbers on the board, and to achieve the highest point score. The player/team to do so first, shall be the winner. Cricket shall be played using the numbers 20, 19, 18, 17, 16, 15 and both the inner and outer bull (cork). Once a player/team scores three of a number, it is 'owned' by that player/team. Once both players/teams have scored three of a number, it is 'closed', and no further scoring can be accomplished on that number by either player/team. To close the bullseye, the outer bull counts as a single, and the inner bull counts as a double. Once a player/team closes an inning, he/they may score points on that number until the opponent also closes that inning. All numerical scores shall be added to the previous balance. Numbers can be 'owned' or 'closed' in any order desired by the individual player/team. Calling your shot is not required. For the purpose of 'owning' a number, the double and triple ring shall count as 2 or 3, respectively. Three marks will close an inning. After a number is 'owned' by a team, the double and triple ring shall count as 2 or 3 times the numerical values, respectively. The player/team that closes all innings first and has the most points, shall be declared the winner. If both sides are tied on points, or have no points, the first player/team to close all innings shall be the winner. If a player/team closes all innings first, and is behind in points, he/they must continue to score on any innings not closed until either the point deficit is made up, or the opponent has closed all innings. It shall be the responsibility of the player to verify his score before removing his darts from the board. The score remains as written if one or more darts has been removed from the board. In accordance with the inherent "strategy" involved in the Cricket game, no alterations in score shall be allowed, after the fact. If there is a chalker for a given match, all darts thrown will need to remain in the board until the chalker and thrower agree on the marks an or points scored. If a player removes the darts prior to such an agreement, the chalker's version will count. This will be final and no appeals to the organisers will be heard. If there is no chalker for a given match, all darts thrown will remain in the board until both players have agreed on a score. If darts are removed prior to such an agreement, the opposing player's understanding of what was hit will count. 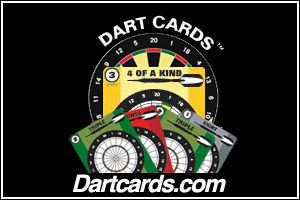 For example, if a player takes his or her darts out of the board and announces "7 19s" and the opposing player states that it was an "3 19s", the score of "3 19s" will count if contested. Please be sure to provide your opponent with the opportunity to confirm your score. This is especially important when playing "cricket".